Your dog is a special friend who deserves the best, and that includes a handmade dog bone toy! This free sewing pattern is easy to make, which means you can make tons of these toys in no time at all. Sewing dog toys saves you money, gives you the option to coordinate the fabric with your home decor, and provides lots of fun! You can choose from two sizes of dog bones, plus tips for making the toy strong and safe for your precious pooch! Optional: A small container with dried peas or beans in it to make a rattle noise. The container needs to be small enough that it will be well padded with stuffing on all sides. A small Tic-Tac candy container works well in the large bone. 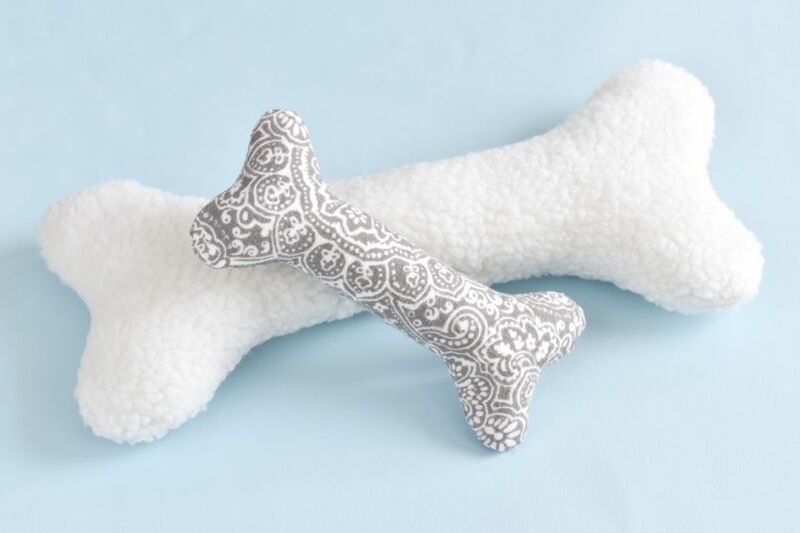 Download the Small Dog Bone Toy Pattern JPG or the ​​Large Dog Bone Toy Pattern JPG. Print the pattern of your choice on regular paper, making sure that the pattern prints at full size. Cut out the pattern. Using two layers of the outer fabric, pin the pattern piece to the fabric, keeping the dog bone shape straight on the grain of the fabric. If you are making the large dog bone, place the straight edge of the template on the fold. When working with thicker fabric, like sherpa, it's best to cut out only one piece at a time. Cut out the dog bone shape. Repeat with the inner fabric so you end up with two outside pieces and two inside pieces. Layer the pieces with the right sides of the outer fabric together. Sandwich those with an inner fabric piece on each side. Pin the fabric so that all of the edges are aligned and held in place by the pins. Tip: To mark the area to be left open, pin one of the straight edges with a pin parallel to the edge. This pin serves as a reminder to stop sewing so that you don't sew the opening closed. Using a scant 1/4" seam allowance, sew the edges of the bone, leaving the opening un-sewn. Back stitch at the start and end. Pivot and turn where necessary to maintain a seam that is an even distance from the edge of the fabric. Clip the seam allowance at all curves so the fabric will lay smooth when it is turned right side out. Be careful to clip so that you cut the fabric just to the sewn seam, without clipping the sewn stitches. To maintain a strong seam, clip the layers separately, clipping one layer and moving a short distance from the first clip to clip the second layer of the seam allowance. Turn the fabric right side out through the opening. Turn in the opening seam allowance and finger press the opening seam line. Finger press the edges and push all seams to the edge of the fabric. Stuff the bone, adding small amounts of stuffing at a time. Fill in the ends first, and then the middle. If you are adding a rattle in the middle of the large dog bone, be sure to work the stuffing in all around it. Use a doubled thread and a slip stitch to close the opening securely. Now your dog can enjoy their new toy! If your dog tends to destroy toys, pay attention to how this dog bone is wearing. If it starts to tear and stuffing is coming out, take it away so your pet stays safe. Prevent any choking hazards. Want to share the love with other pups? Make these easy dog bone toys for your local pet shelter!